Read and listen to the diary of Toronto-based Anglican missionary, Frederick Du Vernet (1860-1924), who visited the Ojibwe of Treaty 3 territory along the Rainy River in 1898. Learn more in conversation with people from Manidoo Ziibi. Read about the land and water of Manidoo Ziibi in student essays on ecology and environmental history. Look at maps showing the Rainy River region and surrounding areas from different moments in history. Experience the beauty and stories of Manidoo Ziibi for yourself at the Kay-Nah-Chi-Wah-Nung Historical Centre. 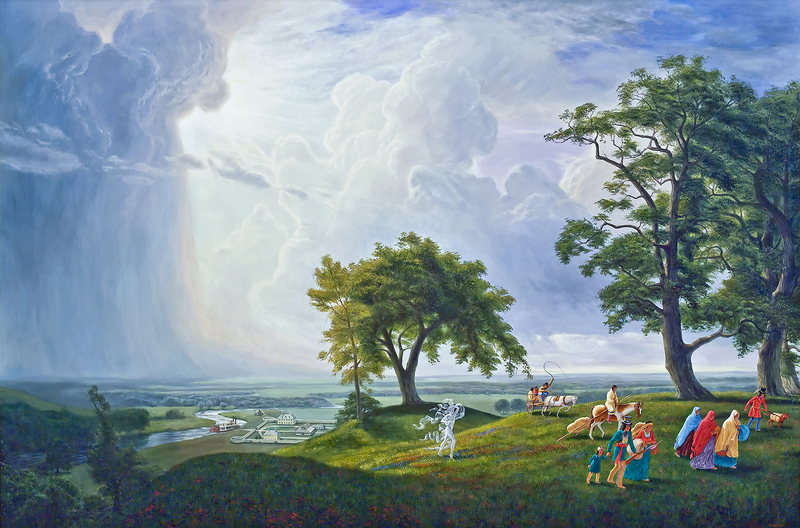 Kent Monkman’s painting, Woe to those who Remember from Whence they Came, depicts the forced removal of the people of St. Peter’s Reserve, along the Red River in what is now Manitoba. His Granny, Carolyn Thomas Everet, lived at St. Peter’s until she was 10 years old. The Canadian government forced the illegal surrender of the reserve in 1908. Frederick Du Vernet’s host on the Rainy River was Jeremiah Johnston, a Swampy Cree missionary who grew up at St. Peter’s.